SAN FRANCISCO (KGO) -- The Paris attacks compelled school administrators to alert police about strange graffiti on a wall at a children's playground at the French American International school in San Francisco Tuesday morning. Police have asked the FBI to investigate, but don't believe it's a terrorist threat. This school has deep connections to Paris. Crews painted over the graffiti Tuesday afternoon. 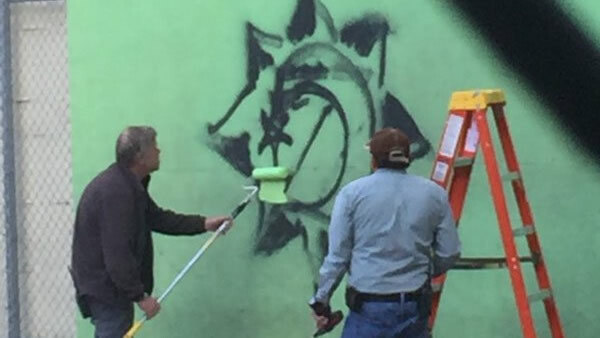 Officials said the symbol tagged on the wall caused quite a commotion when it was discovered. "Obviously in light of what has been happening we thought that it was better to err on the side of caution," French American International school spokesperson Robert Movradinov said. That meant calling in police who in turn conferred with the FBI. Officials determined the symbol is not connected to terrorism. "We have discovered that the graffiti does not appear to be related to ISIS. It looks like it is a domestic group that has some ties to the nation of Islam," San Francisco Police Department Capt. Greg McEachern said. The group is called The Five Percent Nation, or Five Percenters. The movement was founded in the 1960's and is considered an offshoot of the nation of Islam. Many hip hop artists like Jay Z wear the symbol. The Five Percenters believe black people are the original beings. Why someone jumped the fence to spray paint it at the French American International school is a mystery. "I'm not sure what the meaning is towards the graffiti, but I know that we aren't in danger. I think that the school can handle it," student Margo Resnik said. Police said they will continue to investigate to determine if this vandalism amounts to a hate crime. Anyone with information on this crime is asked to call the Anonymous Tip Line at (415) 575-4444.